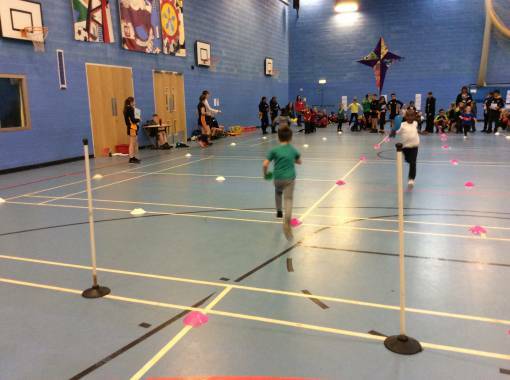 Two hundred and forty Year 2 children participated in the BGN Family multi-skills festivals held at Blessed George Napier Catholic School on Thursday 22nd November 2018. Teams competed in various relay races including bean bag, rugby, scoop, obstacle, hurdles and baton relays. The morning festival involved fourteen teams from Cropredy, Orchard Fields, St. Joseph’s and William Morris Primary Schools and the afternoon festival involved thirteen teams from Bishop Loveday, Hardwick and St. John’s Primary Schools. Competition was fierce across all races with lots of passion and determination on display. Enjoyment amongst participants and adults was also evident with enthusiastic cheering and support, almost raising the roof of the sportshall. The first festival saw Cropredy A narrowly beat St. Joseph’s A by two points to win heat 1. St. Joseph’s B and St. Joseph’s C both won four out of the six races to top heat 2 and heat 3 respectively. In the second festival first place was shared amongst the three schools taking part. St. John’s A won the last four races to win heat 1. Bishop Loveday D pipped St. John’s C by a single point to win heat 2. Hardwick C won three of their six races to win heat 3. During the festival, the Spirit of the Games value ‘Determination’ was a key focus area. One member from each team was presented with a special certificate to recognise their positive attitude and enthusiasm throughout the festival. Thank you to nineteen Year 9 BGN student young leaders who provided a positive experience for all competitors and took on various roles including track judges, scorers, equipment managers and demonstrations. .
Congratulations to all children, young leaders, teachers and additional adults who all contributed to two very fun and enjoyable festivals.